Its operable glass walls redefined the boundaries between interior and exterior space. Now, fittingly, NanaWall Systems is opening new possibilities for architects, designers, business owners and homeowners, with its completely redesigned website at http://www.nanawall.com. The new site makes the exploration and selection process smooth and customized with segmented portals that allow for simple navigation and showcasing of the NanaWall product line. Loaded with new tools, photo galleries and case studies, the website is a comprehensive resource for anyone looking to bring the aesthetics and functionality of NanaWall opening glass wall systems to their residential or commercial projects. 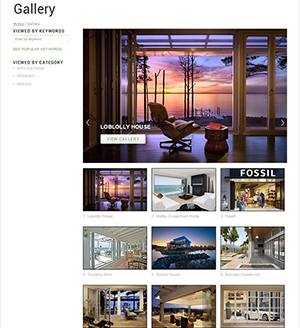 Application Gallery: Conveniently divided into "Residential" and "Commercial" sections for users to find design inspiration, more than 100 case studies, and product owner testimonials. Mobile Friendly: Designed to recognize and respond to any device being used. Product Selector: Products are categorized under folding, sliding and frameless glass wall systems with features and benefits of each product displayed. "Our new website adheres to a beautiful aesthetic that reflects our product line," said NanaWall Systems CEO Ebrahim Nana. "We hope to enrich the journey of architects, builders and homeowners looking for a NanaWall solution by offering a website that makes it easier than ever to visualize an idea and bring it to fruition." With 25 years of engineering experience and more than a million opening glass panels installed worldwide, NanaWall Systems is the industry leader, trusted by architects, design professionals and homeowners. Providing precision engineered opening glass wall systems, the NanaWall product line offers countless style options, unsurpassed durability and superior performance—all based on a foundation of rigorous testing, research and innovation.